Dwayne McLaren has been looking for a way out of his small town upbringing of Cut Bank since he graduated high school several years earlier. When he finds himself in the wrong place at the right time, he jumps at a chance to pursue a better life in a bigger city with his girlfriend Cassandra. But luck doesn’t exist in Cut Bank, and this perceived good fortune is quickly followed by a flood of bad karma. “Hi! Welcome to Cut Bank, Montana, where the Rockies meet the Plains. 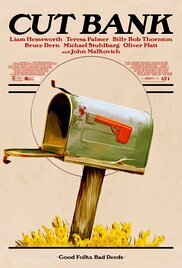 After reading a few reviews (which I normally ostentatiously refuse to do, just to avoid influence) it seemed that “Cut Bank” is very similar to the famous movie “Fargo” made by the Coen brothers. Although I’m a huge film buff and watched quite some movies, I must admit that I’ve never seen this infamous film. Should I be ashamed and did I miss a milestone in the history of movies? Probably yes. But on the other hand I could watch this odd movie unprejudiced. The fact that two leading actors starred in the television series based on the Coen’s flagship, probably influenced the forming of an opinion for some. For me, as an unyielding opponent of anything that smells like a tv-series, this was again an asset. It’s not a work of art with a capital A, but it has a very high entertainment value. The whole brouhaha starts when Dwayne (Liam “The Hunger Games” Hemsworth) and his girlfriend Cassandra (Teresa Palmer) are making a type of promotional film about the town of Cut Bank, a godforsaken place where nothing really spectacular happens, and unexpectedly they witness the murder of the local postman George Wits (Bruce Dern) who makes his rounds with a vintage post car. They confront Sheriff Vogel (John Malkovich) with this murder. The first one that ever happened in Cut Bank. It turns out that there’s a reward for those who can provide evidence about the murder of an official postal employee and Dwayne sees the opportunity to start a new life with his girlfriend far away from Cut Bank. However, there’s an additional problem. The inspector of the postal service (Oliver Platt) must first see a corpse before he hands over the check. And then there’s the strange Derby Milton (Michael Stuhlbarg) who eagerly wants his lost p-p-p-parcel. The fact that the demand for seeing a dead body causes problems, already indicates that not everything looks as it should be. And you can’t tell more about this dark and cynical story without revealing too much. It certainly is all quite absurd and sometimes even humorous. If I should compare it with something, then it’s “Twin Peaks” (well I realise that this makes my earlier statement about tv series totally incredible). Actually, the conditions are almost identical. A small community somewhere in no man’s land where a murder has been committed. And there are also a bunch of weird residents. In “Cut Bank” you meet some unique personalities such as a sheriff who spontaneously vomits when seeing a murder or a corpse, a speechless “native” who communicates via scribbles on a notepad, a brisk old mailman who’s using binoculars to peep at cheerleaders during his round and a crazy taxidermist with an old fashioned pair of glasses with glass like the bottom of a preserving jar who starts to freak out because he didn’t receive his parcel. Even the lunch which Sheriff Vogel and inspector Barrett enjoyed, reminded me of Twin Peaks. Only that this wasn’t about coffee and pie. The eccentric characters and the subtle used dark humor made me enjoy this movie. Unfortunately, the two main characters were not of the same caliber as the supporting actors. Hemsworth was not so determined as expected and the whole film he walked around like a sad puppy. His girlfriend Cassandra is charming and handsome, but that’s about it. Fortunately there was the supporting cast with sounding names like Malkovich, Billy Bob Thornton, Dern, Stuhlbarg and Platt who already have won their spurs. They all played their colorful character with vigour, although sometimes it was really hard to understand what they were raving about when they used their local vocabulary during conversations. Malkovich stars as the desperate sheriff who, even though this is the first murder in his district, succeeds in unraveling the inextricable tangle of successive events. Dern as the elderly postman is hilarious and brings a few dialogues in such a way that it’s clear that he’s not suffering from dementia. But especially Stuhlbarg impresses as the slightly deranged, mentally disadvantaged and stuttering Derby Milton. Every time he appears somewhere, bewildered residents ask the same question again and again (one of the subtly placed humorous incidents). “Cut Bank” is certainly not a masterpiece in terms of originality and it’s not a high flyer. There have been many movies about murder mysteries in a seemingly secluded community and “Cut Bank” also adds nothing new to this genre. I fear, however, that Robert Patino couldn’t really tell which direction the story should eventually go. The end result is a humorous mystery crime that results in a violent slasher story. It’s nowhere really exciting, but nevertheless it was an amusing flick.